Do you have a sore back, aching hips, legs or poor posture? 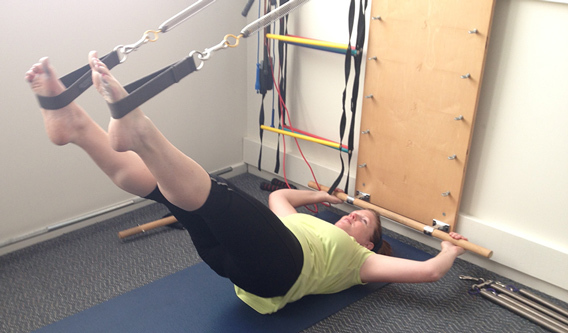 Are you curious about pilates? Has it been recommended by your health professional? Pilates is a system of exercise that is flowing and focused, building core, shoulder and hip strength as well as endurance. It teaches you awareness of breath, body alignment, building coordination and gives you back confidence in your body. With practice people can obtain improved posture, greater abdominal/core and back strength, flexibility, improve balance and gain a trimmer more agile and stronger body. At the Pilates classes you work to your level. The classes include props such as free weights, Pilates circles and foam rollers to vary and intensify the Pilates program. With one or two people the Pilates springboards can be used. The springboard is like an upright reformer bed. Pilates is also available in private sessions. 6.00pm- a core, deep joint stretch and foam roller session. 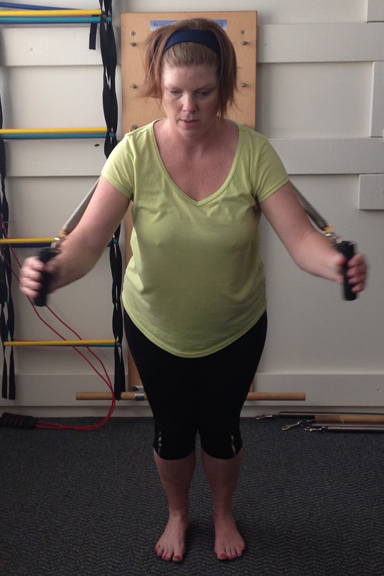 I have been attending Michelle’s Pilates and NIA classes now for almost six months. Whilst I had heard of Pilates and had friends who attended classes, I had no idea what to expect, or whether I would in fact enjoy it. 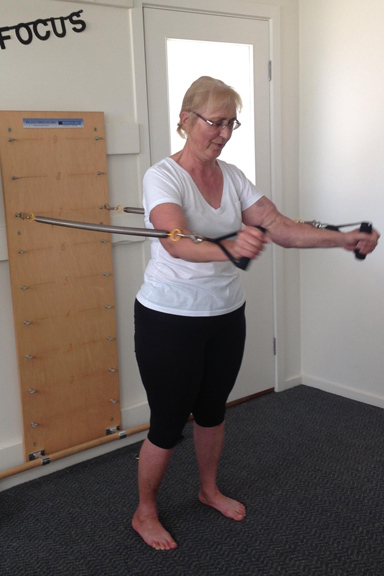 My sole purpose for attending Pilates initially was to improve mobility in my hips, due to having undergone bilateral hip surgery, which was successful; however, one hip has continually been causing me severe pain. 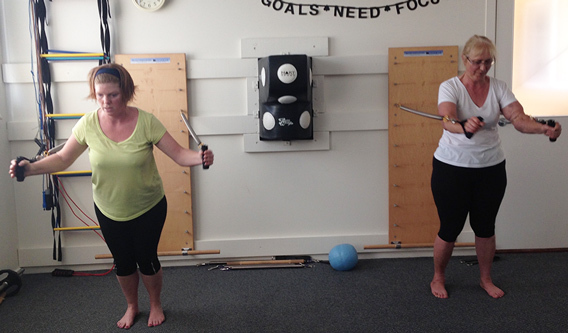 After the first few sessions with Michelle, the benefits of Pilates was becoming apparent, my hip movement had improved, and I was starting to become more aware of my posture and stance – I was hooked! I can’t thank Michelle enough for getting me back on my feet! After suffering a work related back injury a number of years ago, I had struggled to get back to the level of fitness and flexibility I had previously enjoyed. Michelle at Vitalitymoves was recommended to me and from the moment I stepped in the door, her knowledge, enthusiasm and understanding of the human body was evident. I worked with Michelle on a weekly basis as she customised a program to suit my individual needs. Between her dedication and my hard work (really hard sometimes!) my posture, endurance and flexibility have all improved to a point where I feel my quality of life is as good as it has ever been. My reliance on medicinal pain relief has also been reduced which is a great side effect. I have the utmost respect and trust for Michelle and can’t thank her enough for getting me back on my feet! I first came to you weak as a kitten having been extremely unwell for the whole of the previous year with Myasthenia Gravis a neuromuscular condition. Now I can hardly recognise myself, I am so much stronger and fitter. So much of my improved condition and new found confidence in my physical abilities is due to your wonderful work with me. Your hugely professional and sensitive approach makes me feel safe in your hands and our sessions are not only good for me, but its lovely that we have a good laugh now and then as well. I know that you have a real feel for each individual’s needs and can set programs that suit all anyone, whether we are ultra fit or are embarking on exercise for the first time. The Pilates and Nia classes are just terrific. When I first started these with you I was concerned that I would feel self conscious and unfit, but you make everyone feel welcome. The atmosphere you create at Vitalitymoves is positive and encouraging. Your information on all things, both holistic and conventional to do with keeping the body, mind and spirit healthy has helped me immensely while I’ve been working to recover my health. It’s fabulous to feel that, as I continue to work with you into my fifties, I can look forward to being stronger and more mobile than I was in the previous decade. Hey, I can even see the possibility of awesome arms, no bat wings and being able to wear singlets into my nineties!!! You really have made an enormous difference to me in my journey back to health and I look forward to continuing our training and classes together.